A Good Night Sleep is Closer than You Think! Do you find that you become drowsy at random times throughout the day and it becomes hard to concentrate? Is restlessness a part of your daily routine? If so, you may be suffering from sleep apnea. Although thousands of people are diagnosed with the condition each year, many more thousands go undiagnosed. Sleep apnea occurs when a person is sleeping. However, the side effects of sleep apnea occur throughout the day. While patients may suffer from some of the common sleep apnea symptoms, such as headaches and daytime sleepiness, many do not think that these problems are serious. Because the symptoms are not overly alarming, it’s rare that a patient will go to his or her doctor or dentist to have the problems examined. This lack of recognition of the symptoms of sleep apnea is what truly makes sleep apnea that much more dangerous. Sleep apnea is a condition that causes the patient to stop breathing at various times throughout the night. Studies show that such patients usually have pauses in normal breathing hundreds of times each night, each episode lasting up to 30 seconds, if not longer. There are three types of sleep apnea: obstructive, central, and complex. Each one is identified by abnormal periodic cessation of breathing, though the cause of the cessation is different for each apnea type. 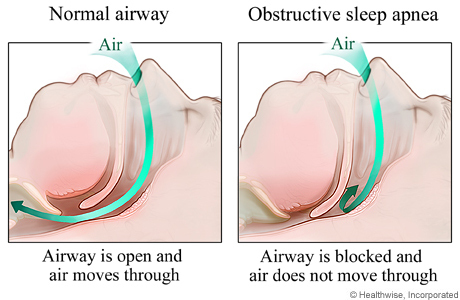 Obstructive sleep apnea is caused by a blockage within the airway that impedes the natural flow of air. Central sleep apnea occurs because the brain does not send the proper signals to muscles that control breathing. Complex sleep apnea is a combination of these two. This makes diagnosis even more vital as it is important to not only know if you have sleep apnea, but to further know what type you have in order to receive proper treatment. Sleep Apnea Testing A sleep study (also called a polysomnogram) is the only definitive way to tell whether or not you suffer from sleep apnea, and how severe that apnea might be. Sleep studies can be conducted in a sleep laboratory or at home using an ambulatory sleep study device, such as the ApneaLink Plus. These tests are painless, simple to administer and generally take one night. The results are analyzed by a physician who will then give a definitive diagnosis. Once you’ve received a diagnosis, Dr. Fish can help you to find the treatment that is right for you. CPAP Alternative The continuous positive airway pressure machine, or simply CPAP, is truly the gold standard for treatment of patients with sleep apnea. CPAP is the most widely used sleep apnea treatment method because, when a patient can comply with the treatment, it works. The patient wears a mask connected to a machine via an air hose that delivers a continuous, steady flow of air throughout the night. Patients who actually use a CPAP machine never have to worry about breathing at night. Even though the CPAP is the go-to treatment for sleep apnea, many patients do not comply with usage. Among other issues, patients who are fitted with a CPAP often complain of discomfort and noise. Others complain about rashes caused by the mask or frustration with the straps that hold the mask in place. For those patients who do not tolerate CPAP treatment, there are alternative treatment methods. Oral appliance therapy, or OAT, has long been recognized throughout the dental world as the best alternative treatment, especially for those diagnosed with mild to moderate obstructive sleep apnea. Oral appliances are mouthpieces worn at night. Such appliances move the lower jaw forward, allowing more room for the soft tissues of the throat and opening up the airway. Are you interested in learning more about CPAP alternatives? Contact us today so that we can get you on the road to recovery. Have Your Sleep Apnea Treated Today! If you’re unsure whether you have sleep apnea and are interested in being tested, Dr. Fish, along with the help of a sleep physician, will be able to provide you with the answers you need. We know the true danger that lies behind untreated or improperly treated sleep apnea, and we want to help! Call our office today.